Yesterday was the day we gathered to plan our pairings for our sixth round of beer and cheese pairings with O’Brien’s. Tom Nickel (owner of O’Brien’s), George and Mary were joined by tasting panel guests Sandy and Todd Webster, winners of the early-registration drawing. As always, it was a lot of fun – and a lot of work at the same time. In the end, we came away with an amazing menu of all-new pairings including an all-German flight, a truffle pairing and a sweet finale that will go down as one of our best ever. It’s one you definitely won’t want to miss! Space is filling fast so don’t delay, sign up today by sending an email or calling us at (619) 683-2306. If you have an event coming up, send an email to Ted@FromageBlog.com for listing in the web site. This weekend, the entrance to Notre Dame in Paris smells a lot better. The annual Fête du Pain features fresh bread baking, classes for children, demonstrations, and a large display of French cheeses. The festival will continue on Sunday. It’s geared for the younger bread lovers, so take the children with you. Food festivals are always fun. You’ll find obscure dishes (garlic ice cream at the Garlic Festival), pseudo-celebrities (William Hung at the Artichoke Festival), beauty queens, and some really great food to eat and buy. 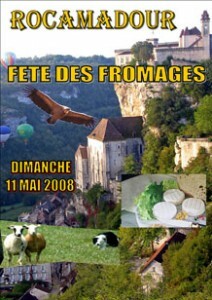 Rocamadour is a small town in France that features an annual Fête des Fromages in May. 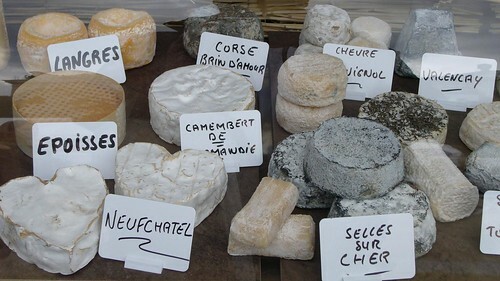 It’s the largest cheese fair in Southern France, with over 50 producers arriving to share their products. This village has a cheese named after it, i.e. Cabécou de Rocamadour or more commonly known as “Rocamadour“. Since being awarded the AOC label in 1996, the producers have abandoned the name Cabécou as it’s too generic and hence today the cheese is just called “Rocamadour“. This also enables them to differentiate Rocamadour from the many Cabécou that exist. Rocamadour can be eaten at the various stages of maturation. When it’s between 1 and 2 weeks maturity it has a subtle acidic aroma and a slight nutty taste. As the “affinage” progresses, these characteristics mature and become more pronounced.